Recently I corresponded with a researcher who had come up with a creative approach to answering a family history question. She just needed someone in Chicago to carry out her plan. I said, "Sure. I'll give it a try if it's okay with you if I blog about it." She said it was. Her husband's ancestor's family was in Chicago in 1868. One of the family's children was baptized at Holy Family in 1873. The mother was listed in the 1880 New York census as a widow. When did the father die? When did the family return to New York? 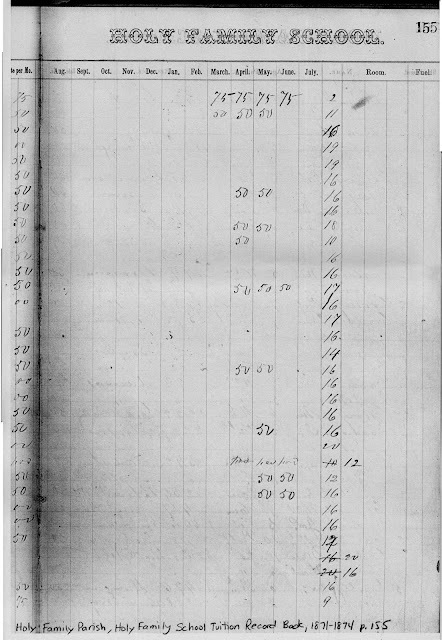 The researcher had learned that Holy Family Parish School Tuition Records, 1865-1879 were available at the Loyola University Archives and Special Collections and she thought that at least one of the family's children would have been enrolled. Her hope was that the tuition records could help her zero in on when the family left Chicago. I called the Archives and made an appointment to visit. (Hours and FAQs) It was an easy trip on the Red Line. I got off at the Loyola stop, crossed the street to campus, and walked toward the lake. The sidewalk wound between a number of buildings and easily led to the Cudahy Library. I showed identification, signed in, and made my way to the archives room where I was met by an associate archivist. She was friendly and welcoming and went out of her way to help me access the records I was there to use. The Holy Family Parish School Tuition Records were kept in large bound ledgers and although the bindings were somewhat fragile, the pages were sturdy and easy to use. The books are divided into sections by first letter of surname, but entries are chronological, not alphabetical. 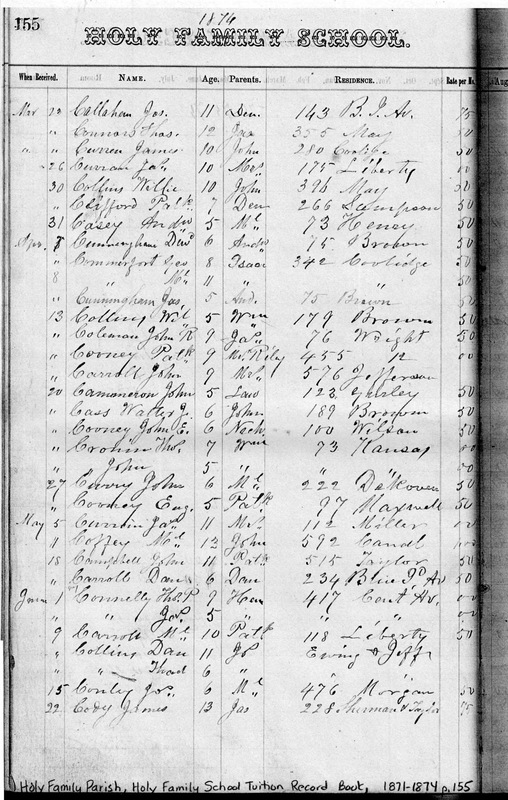 As I read through each year looking for the researcher's family names, I noticed that many children returned year after year and children from the same family were usually entered together. These records could be used to track a family's address. The could also be used to approximate the birth dates of children in a family. I'll include two example images below so that you can get a feel for what the records are like. So, was the search of use to the researcher? I think so. 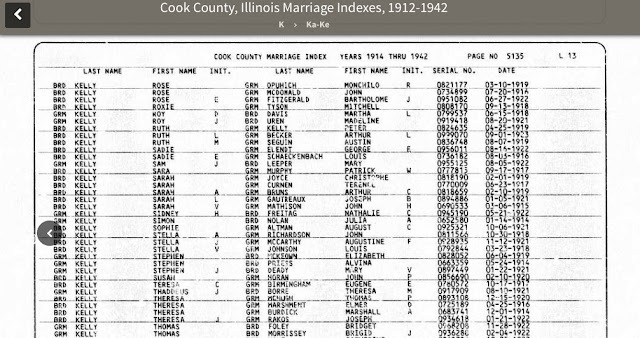 I was able to find one entry listing two of the family's children and from it the researcher learned that the family was still in Chicago in 1874, living at a previously-unknown address. The children were received in April but they paid no tuition, so it wasn't possible to determine when they might have left the school. I really liked the researcher's resourcefulness in trying to answer a hard-to-answer question. If you know of any other off-the-radar Chicago records that could be used in similar ways, please post a comment and share. A kind reader shared a link to a Finding Aid for Holy Family Records. Follow the link to learn about the records that are available at the Archives. I love visiting cemeteries, wandering the rows, reading the stones. Sometimes a particular monument will catch my eye and I'll stop for a minute and wonder about the person who's buried beneath it. For me, that's as far as it goes. But not for Jim Craig. Last year, Jim started a blog called Under Every Stone and he uses it primarily to tell the stories behind gravestones that catch his eye on frequent Find-A-Grave trips to local cemeteries. Most, but not all, of the posts relate to Chicago families. The first entry, "Finkelstein: Four Souls in One Tomb," tells the tragic story of a family that succumbed to a gas leak from an open jet in their kitchen in 1903. Another early post tells the story of Lazarus Finkelstein from Russia Poland who died in Chicago in 1918 at the age of 107. And then there's the recent entry for Sammy Meisenberg (now spelled "Mizenberg" by the family) titled "Born a Jew, Lived an American, Died a Patriot." He was killed at Vera Cruz in 1914 and his death became part of Chicago's history. A newspaper report that Jim shared in his post estimated that 100,000 people would participate in Sammy's funeral. It's all about remembering, really, and I'm touched by each story that Jim tells. Under Every Stone is on my short list of favorite blogs. If you haven't visited, I hope you'll take the time to do it. I think you'll be well rewarded. I keep an eye out for information that's useful to Chicago researchers and I have a couple of things to share today. 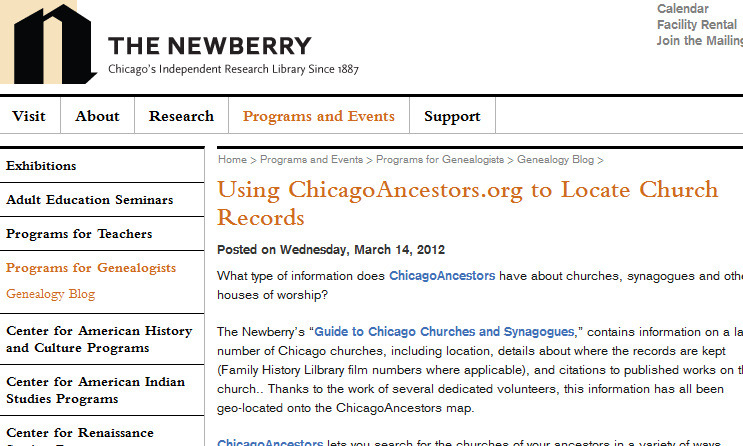 First, Ginger Frere of Information Diggers recently shared a link on a mailing list that I subscribe to for a Newberry Library blog post titled "Using ChicagoAncestors.org to Locate Church Records." Even if you've used the site to search for churches, take a look at the post. Good chance you'll learn something new. 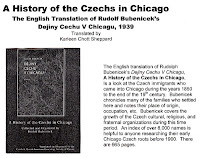 And then, a genealogy friend recently made me aware of a new Czech and Slovak American Genealogy Society of lllinois (GSAGSI) publication that will be of interest to researchers with Czech ancestors. 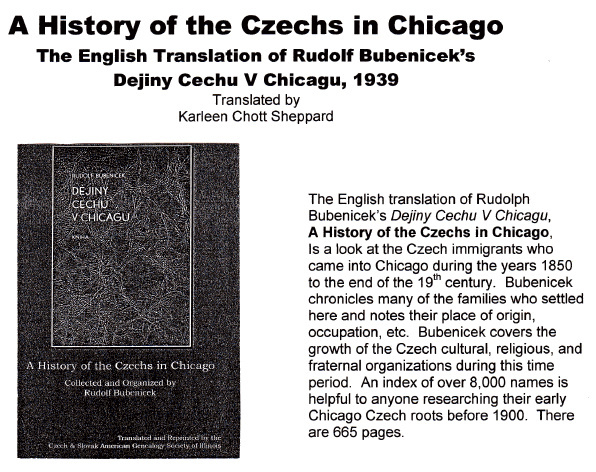 It's Karleen Chott Sheppard's translation of a 1939 book titled A History of the Czechs in Chicago. Here's a link to a flyer with more details and ordering information. 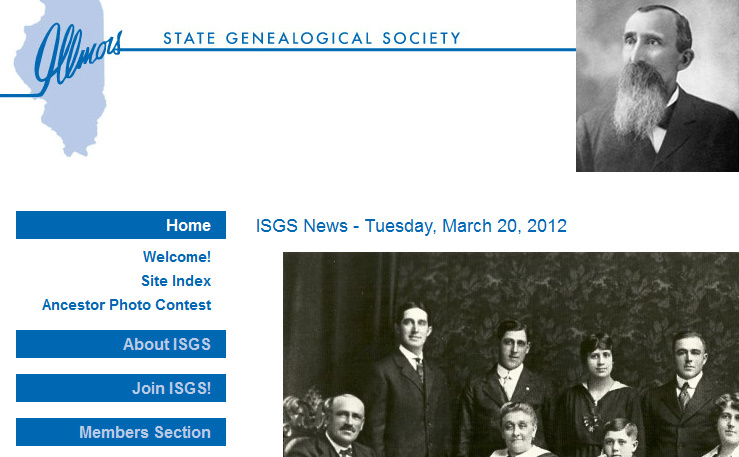 And finally, the Illinois State Genealogical Society has scheduled free monthly webinars for 2012. The next one will be April 10, "Going Digital: Organizing Your Research Files Electronically" given by D. Joshua Taylor and Jean Wilcox Hibben (a friend and fellow old-time music enthusiast) will be presenting "Clue to Clue: Tracking a Family Over Time and Miles" on July 10. Check out the schedule! What If You Could Read 50,000 Foreign Language Articles from Chicago Newspapers in English? You Can! Yesterday, Chicago-area genealogist Jennifer Holik-Urban posted on the ChicagoGenealogy Facebook group to make researchers aware of the Foreign Language Press Survey. It's a new-to-me resource for Chicago research and a valuable one if you have foreign-born ancestors. The site provides access to translations of almost 50,000 articles from newspapers serving 22 ethnic and linguistic groups in Chicago. These translations were done as part of a Works Progress Administration project in the 1930s. Visit the survey site (use the link above) and click on "Read about this historic project." As researchers, sometimes we have to guess how or why a particular resource was created. That isn't the case here. In fact, the background information is detailed. If you click on the "Press Survey Codes" link, you can read through the subject guide that was used to pick articles for the project. Click on "Return to search" to get started. I didn't have a name, so I typed in "bicycle" (inspired by Chicago's unseasonably high temperatures this week?) and explored the results. 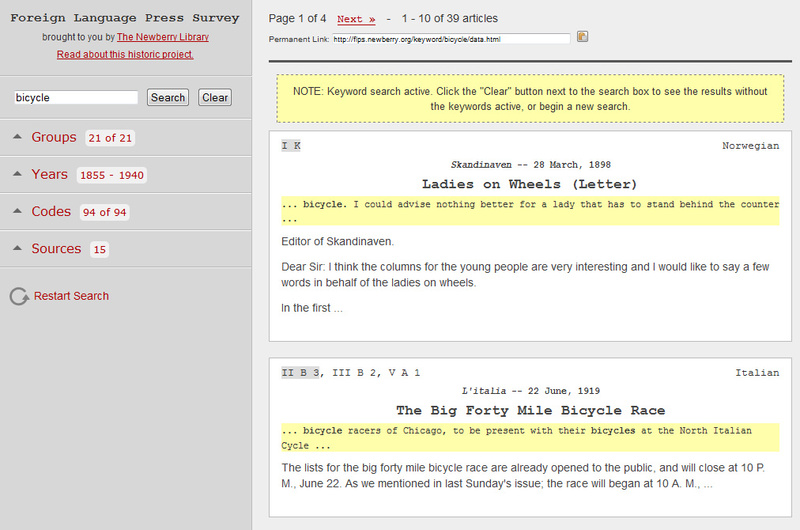 One of the first entries was a letter to the editor of Skandinaven (28 Mar 1898) titled "Ladies on Wheels." The subject was "Norwegian // Attitudes > Position of Women and Feminism (I K)" and clicking on it brought up related articles. Exploring further, I found mention of German and Polish bicycle clubs, an appeal for contributions to the family of a young Bohemian boy killed while learning to ride a bike, and a biography of the Danish owner of a bicycle company. 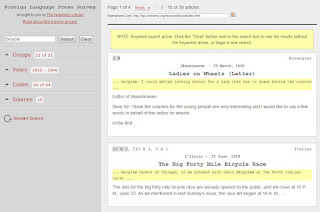 Even if you can't find mention of the specific people you're researching, the articles provide a valuable way to learn more about the communities in which they lived. Thanks, Jennifer. And all the best with your March 28 release of Branching Out, a new genealogy textbook series for kids! 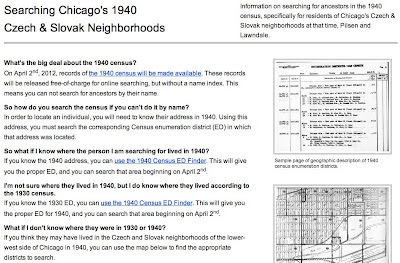 Kevin Hurbanis sent me a link to his "Searching Chicago's 1940 Czech & Slovak Neighborhoods" page this morning and I asked permission to share it. It's meant as a tool for people who will be looking for ancestors in Pilsen and Lawndale, but it's nicely done and I think it has information that's relevant to us all. Take a look when you get a chance. 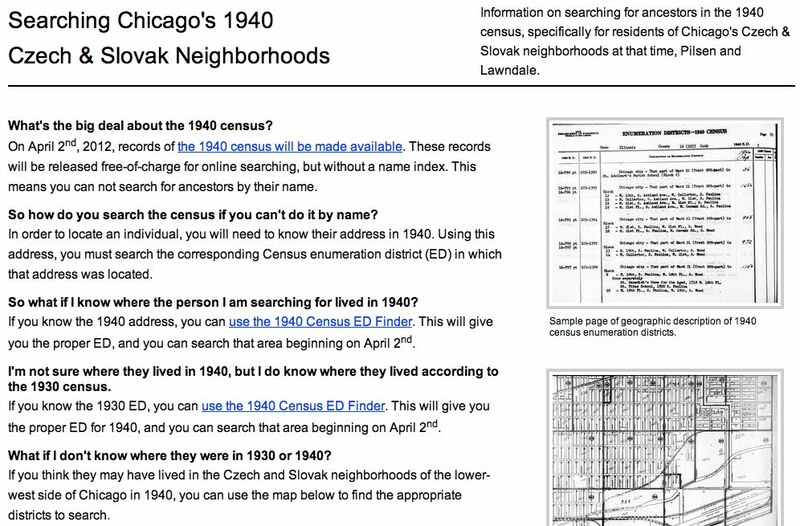 And if you know of any other 1940 census tools for Chicago, please post a comment and let us know. Update: I posted on the ChicagoGenealogy Facebook page this morning and a group member reminded me that Stephen Morse has some great tools for census research on his One-Step Webpages. Check those out, too! Saturday evening I went to a Fiddle Club of the World gathering to hear Finnish fiddler Arto Järvelä play with the American duo Kaivama. How was it, you ask? Click through to Arto's website and listen to the tune he has playing on the main page. Yes. Do it! Before reading any more, click the link. It'll open in a new window and the music player will start automatically. Now multiply that sound by two exquisite fiddlers playing in harmony and add in a brisk rhythm from mandolin or guitar or a slow drone accompaniment on harmonium and you will understand why the only word I have to describe the experience is, well, "incredible." And what does this have to do with Chicago genealogy? Plenty, actually. Kaivama musicians Sara Pajunen and Jonathan Rundman are Finnish-Americans hailing from Finnish immigrant communities in Michigan and Minnesota. During a break between tunes, Sara noted, with great feeling, the connection that the music provides to their cultural heritage. In the midst of collecting names and dates and places, maybe even photos and family stories, let's not overlook the power that music has to strengthen our ties to our ancestors. Irish? Check out programming at the Irish-American Heritage Center. Click on the "Education" tab to explore classes in music and dance. Swedish? Stop by the Swedish American Museum. I see both a dance and a jam on the calendar for March. Ukrainian? A search for the topic "music" in the Ukrainian National Museum's library catalog returns 80 results. Polish? The Polish Museum of America has a music library with 4000 78rpm records donated by the family of a Polish music store owner. If your ancestors came from other places or if you're not local, just Google. I suspect you'll be able to turn up all sorts of creative ways to learn about your family's musical heritage. Arto, Sara, and Jonathan are touring the mid-west right now and they have concerts planned for Michigan, Ohio, Missouri, Iowa, Minnesota, California, Oregon, and Washington. Kaivama Concert ScheduleIf you have Finnish ancestry and live near one of the cities they'll be visiting, or if you'd just like to be inspired to learn more about the music that accompanied your own ancestors through life, you should go. Really. You should go. 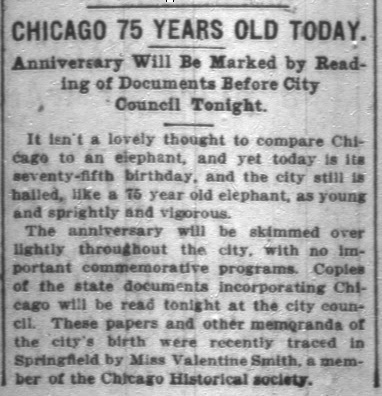 Chicago celebrates its 175th birthday today and news of the festivities reminds me of--well, actually, it reminds me of Valentine Smith, my husband's 1st cousin 3 times removed. 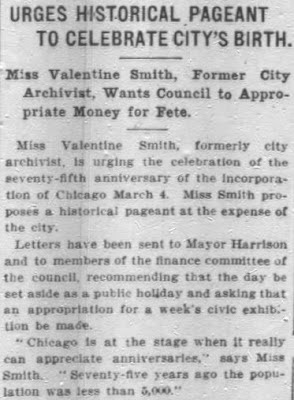 In January of 1912, she urged the city fathers to create a public holiday and fund a 75th birthday party for the city but they chose, instead, to read the incorporation documents in a city council meeting. Twenty-five years later, though, they threw a party and invited the world to stop by. Chicago celebrated its centennial with the Century of Progress Exposition. Unfortunately, by that time Valentine was living at the Kankakee State Hospital. Even if she caught word of the world's fair, I think it's unlikely that she was able to attend. If she had gone, though, she would have liked it. A lot.